HomeBLOGAre You Designing for Translation? Editor’s note: Many of us in the HIV community need to reach a wide audience and communicate in multiple languages. Read on for tips to adapt your web content into multiple languages. You need to create new content—perhaps a website or another type of asset. It is at this point that you’d want to determine whether this content will also be used to communicate with audiences whose primary language is not English. Knowing that this content will be produced in other languages will help you make choices that will aid the translation or transcreation process, and ensure that the content has the elements needed to have a successful adaptation for all intended audiences. Let’s consider the different content elements listed below. Plan ahead. A multilingual offering should not be an afterthought since not all languages are created equal. If you plan your text for translation, this will save you time, money, and lots of headaches. Text length (also called text swell) differs among languages. English is a succinct language, but romance languages such as Spanish, Portuguese, French may take 15% to 20% more room (longer words and sentences). Direction and special characters. Folks whose language is written right to left (Arabic, Persian, Urdu, etc.) or vertically in addition to right to left (Chinese, Japanese) will also scan pages that way. Dates and numbers. Pay special attention to dates and numbers as different cultures use different notations, decide on a style and stick to that to avoid confusion. You may want to see USAGov’s Style Guide Dates and Times and Numerical Information as an example of different treatment between English and Spanish styles. Understand voice and tone; different cultures may have different preferences. Avoid colloquialisms and any other terminology that may be unfamiliar or have a completely different meaning in other cultures. This will streamline the translation process, and cut down on errors and possibly cost. Use dedicated URLs for each language. Many folks will search for content in their own language; using the international convention for URLs, help your customers find the content they need in the language they prefer. A couple of good examples are IRS.gov, which has content in five additional languages (check out the language dropdown on the header), and CDC en español. Additionally, the World Wide Web Consortium (W3C) has guidance about language tags and internationalization. Use active verbs, they make the text clear and more concise. Write short sentences—this helps with clarity too (the guideline is one sentence per idea). Use spacing to separate sections/ideas; this helps reading and comprehension. Seek clarity in instructions—test it yourself, can you follow them? Avoid jargon and technical terms—if you must use either, explain them. Stay away from acronyms—but, if required, spell them out the first time (e.g., U.S. General Services Administration (GSA)). Avoid synonyms, and use terminology consistently to convey the same concepts; this increases clarity. This goes without saying, but, before sending the text for translation, proofread it. Make sure there are no typos, ambiguities, and incorrect punctuation; this will help the translator, avoid headaches, and avoid incurring the costs of fixing errors later. Whether designing printing materials or digital content, evaluate at the onset if these will be offered to a multilingual audience and plan for that. Allow enough space for the text to fit in the layout; consider designing for longer languages first. Take into account the direction of the text. Use international symbols, they are very successful at conveying a message regardless of language or cultural values. Think about signs at international airports; they are a great example of visuals everyone can understand. When using images, think about culture—does your image mean the same, regardless of culture? Images carry different meaning depending on cultural values, it may be wise to do some user research before investing in expensive images or graphics, trademarks, etc. Beware of automatic hyphenation. If you use word processors or layout software, automatic hyphenation could be a nightmare since hyphenation rules vary with language. 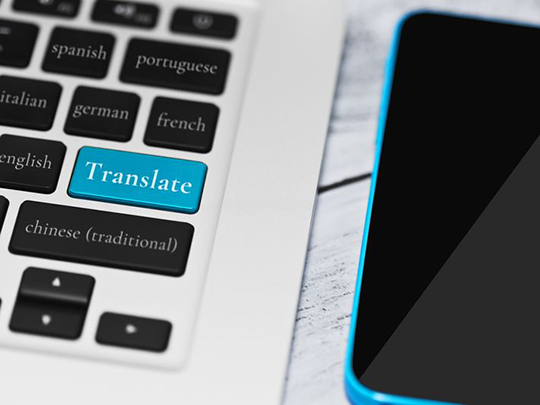 Designing for multilingual offerings is no easy task, but with some preparation and forethought, it can go very smoothly and be really successful. Join the Multilingual Community of Practice—a group of multilingual professionals around the government working tirelessly to improve and expand multilingual content for people with limited English proficiency. All references to specific brands, products, or companies are used only for illustrative purposes and do not imply endorsement by the U.S. federal government or any federal government agency.